I will start this Game vs Book series small and easy, folks. Here is the situation: It is now December 18th 1944 and the Germans drive their armor through the Ardennes for a second time in five years. Kampfgruppe Peiper is the spearhead of the 1st SS Pz. Div. and the immediate mission is to cross the Meuse river. The road ahead is not exactly tank country, as seen in the map below. Right click and open in a new tab for a better view. This map is ~20 km wide. The German units's (black icons in the map) major objective is to exit this map (yellow icon top left of the map) after crossing the Meuse river. In order to do so, and to ease up the movement of the follow up components of the division, the Werbomont highway is of great importance. Such highway can be rapidly reached if the crossing at Trois Ponts is under German control. Trois Ponts, in turn, can be reached from either side of the Ambleve river (the river near the German units). 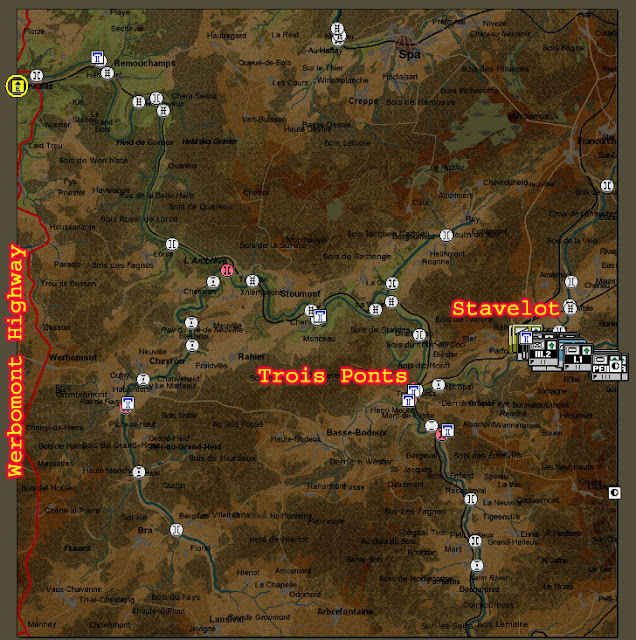 But the approach to Trois Ponts from the northern bank of the Ambleve is more desirable from a military point of view (better and straight road compared to the convoluted trails south of the Ambleve). Excellent idea...looking forward to this. I also thank you picked the right game to introduce this series. You got me to fire up HTTR and do a scenario. Spoiler alert: get ready for some incoming arty!